This is an old post, dating back mostly to 2011. It is preserved here for archival purposes. 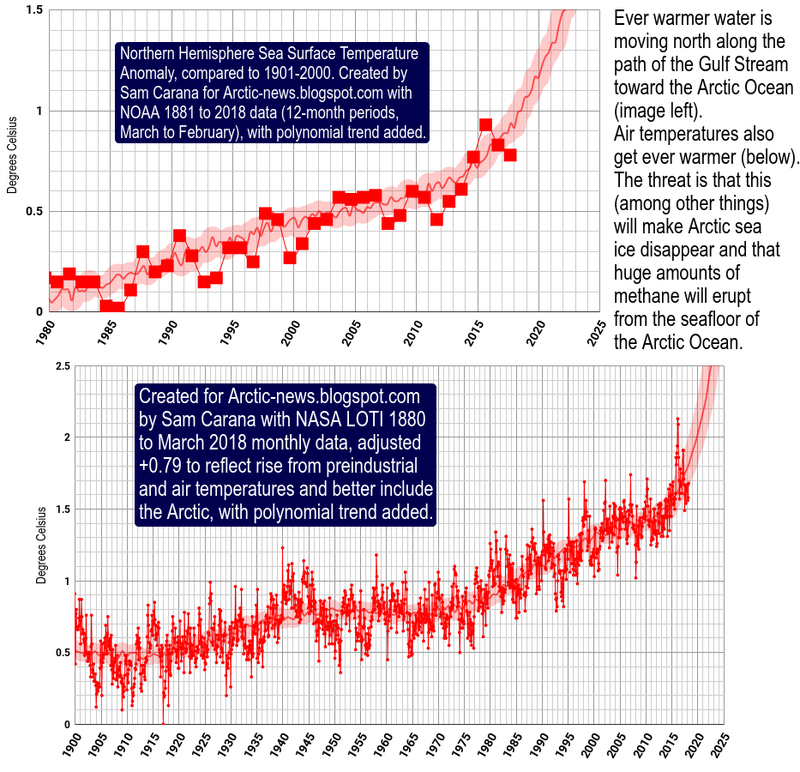 “The water is getting warmer, and warm water holds substantially less oxygen than cold water . . . Off southern California over the past 22 years we’ve lost about 30% of the oxygen at depths of around 200 to 300 metres,” said Professor Lisa Levin of the Scripps Institution of Oceanography in La Jolla, California. Deep-water temperature gauges off Spitsbergen in the Arctic and in the Southern Ocean near the Antarctic have recorded temperature increases of between 0.03°C and 0.5°C, and as much as 1°C, which is highly significant for a stable environment that does not change at all from one century to the next, she said. “Those are significant numbers. The warming is more intense at the sea surface but it reaching the deep water,” Professor Levin said. Above from: Report by Steve Conner in the Independent, February 21, 2012. The above report is particularly relevant in regard to methane hydrates, as illustrated by the text below, which acts as an archive of earlier suggestions by Sam Carana, up to end 2011. When methane is released from hydrates in underwater sediments, much of it can still be oxidized in the water. This would not be the case for large releases of methane, which would cause oxygen depletion, resulting in much of the methane entering the atmosphere. Furthermore, global warming makes the situation worse, as warmer water holds substantially less oxygen. 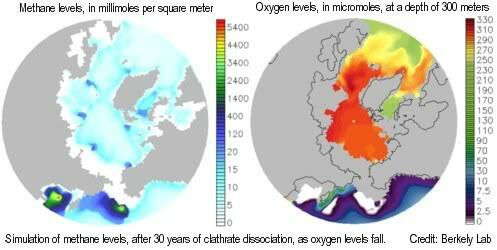 A two-part study by Berkeley Lab and Los Alamos National Laboratory shows that, as global temperature increases and oceans warm, methane releases from clathrates would over time cause depletion of oxygen, nutrients, and trace metals needed by methane-eating microbes, resulting in ever more methane escaping into the air unchanged, to further accelerate climate change. 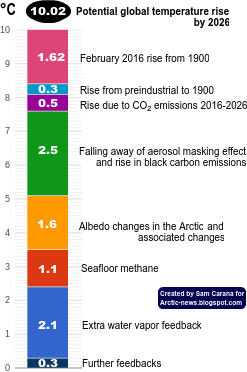 In many ways, global warming sets the scene for catastrophic releases of methane in the Arctic. To avoid such scenarios, or even more worrying scenarios in the Arctic, it may be helpful to artificially add oxygen to the water. This has been done before, e.g. in lakes in Finland (see image below). On the one hand, oxygenating Arctic waters seems beneficial, as this could enhance oxidation of methane in the water. Also, oxygen bubbles could form an insulating layer in between an ice-cap and warming water underneath the cap. 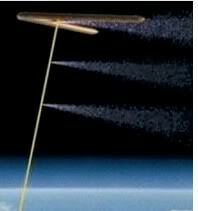 Thirdly, bubbles could brighten the water, changing albedo and reflect more sunlight back into space. Where oxygen enters the atmosphere, this may help with the formation of hydroxyl and subsequent oxidation of atmospheric methane. On the other hand, though, some processes could be counter-productive. As an example, bubbles could disturb a hydrate and accelerate release of methane. Rising bubbles could take more methane along upwards than they help oxidize. Experience in Finland shows that adding oxygen could also increase concentrations of nitrous oxide, a greenhouse gas with tremendous global warming potential. Also, producing oxygen locally through electrolysis could result in the release of hydrogen that could bind with oxygen or result in hydroxyl and stratospheric ozone depletion. Tests are therefore recommended, in order to research what kind of impacts and side-effects can be expected. Proposals have been around for years to ventilate bottom waters by stimulating mixing with waters from mid- or upper-levels, as depicted in the above image from a study by Daniel Conley, or by adding air to the waters locally. Producing large amounts of oxygen from water locally may result in large amounts of surplus hydrogen, for which there is may not be enough local demand to make this process economic. This wouldn't be such a problem when producing the oxygen at lower latitudes. Wind turbines on bases, floating offshore the coast of, say, California, New York or the U.K., could supply electricity for use on land during the day, while at night powering electrolysis of seawater (possibly preceded by distillation), to produce oxygen and hydrogen. Part of the hydrogen would be used to power ice thickening, e.g. by pumping up seawater and spreading it out over the sea ice. The vessels could also act as icebreakers to keep paths open through the sea ice during the cold season, which will also help with the transfer of heat out of the Arctic Ocean into the atmosphere, to avoid destabilization of methane hydrates at the seafloor of the Arctic Ocean. Another part of the hydrogen would be used to power the associated shipping, since the hydrogen and oxygen would be transported in separate tanks by ship, either liquefied or as compressed gas, to the Arctic. On arrival, a hose could be lowered from the ship into the water to release oxygen, or - in another application - a balloon could be launched, raising a hose to the desired height, and oxygen and hydrogen could be pumped up the hose for release into the atmosphere, in efforts to oxidize methane in the atmosphere, possibly in the form of hydrogen peroxide that is then, through catalytic decomposition, transformed into hydroxyl. If desired, the same hose could also be used to release aerosols into the atmosphere, in further efforts to keep the Arctic from overheating. Finally, such hoses could carry devices to monitor composition of water and atmosphere, temperatures, currents and winds at various altitudes, etc. 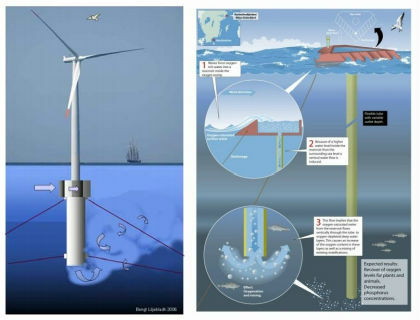 Funding for the project could be provided in part by the electricity sold by the offshore turbines. To further fund the project, fees could be imposed on international shipping and aviation, e.g. on departures from U.S. seaports or airports, or on bunker fuel and jet fuel taken on board such ships or airplanes. The revenues of these fees could be used partly to fund the Arctic oxygenation project, and partly to fund rebates on hydrogen that is produced at the floating bases and sold to ships anchoring there. Such feebates could make shipping and aviation join in with more effective action on climate change, the more so since shipping and aviation could benefit from innovation in the production of hydrogen. Alternatively, such feebates could be imposed on international shipping only. Other types of feebates could then be imposed on international aviation, e.g. to fund air capture of carbon dioxide, and to fund production of biofuel, either in algae bags or as a result of pyrolysis of organic waste. More generally, feebates are the most effective way to facilitate the shift towards a sustainable economy. Another approach is suggested by Nualgi.com who propose to add iron and other trace metals/micro nutrients to the water in order to stimulate growth of a specific type of phytoplankton called diatom algae, which through photosynthesis absorb carbon dioxide in the water and add oxygen. The oxygen is then used by methanotroph bacteria to oxidize methane. 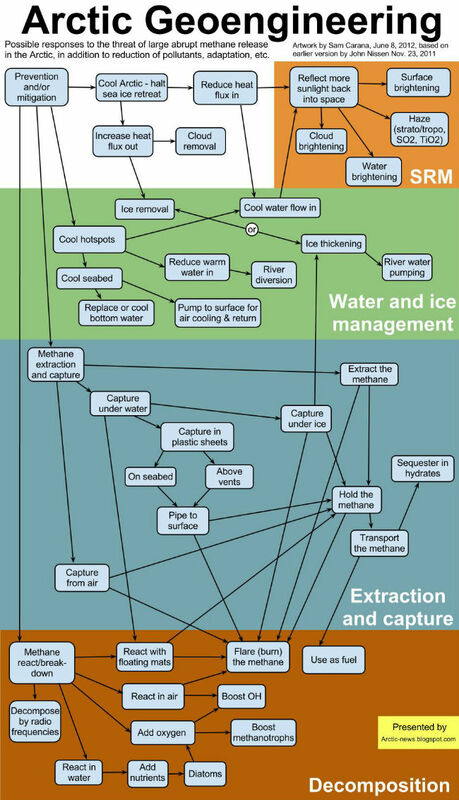 The image below pictures a range of Arctic geoengineering methods that could be used as part of a comprehensive plan of action to deal with climate change. However there reaches a point where use of, abuse of O-I-L^ reaches a critical POint; along with land use abuse and ocean contamination, not least by heat, that the whole system collapses. And that point may in aggregate have been cumulatively surpassed by man. -That would in my estimation be a worthwhile goal.. I've wondered if ocean oxygenation through wind or solar might help those areas of the ocean that are over-nitrogenated dead zones. i'm thinking of the dead zone in the Caribbean south of the Mississippi.